The Modero 30 in. vanity has a simple clean design with a rich espresso finish and brushed nickel hardware. It is constructed of solid poplar wood and veneer with soft-close doors and drawers that showcase its quality. Match it with the natural beauty and durability of a stone top and you create the perfect vanity ensemble. Modern, stylish and sturdy, this 36-inch espresso-finished vanity infuses a warm, inviting ambience into any bathroom. Richly coloured and durably built with a seamless appearance, homeowners and builders seeking a refreshing aesthetic will be enamored with this powder room cabinet. Solid birch wood forms the frame, which secures a full-width bottom drawer and double cabinet doors into place. Soft-closing, adjustable hinges are mounted to the interior, contributing to the vanity's clean look and allowing the inset doors to perfectly align and lie flush with the cabinet face. Slam-preventing slow-close glides straddle the drawer so it eases into place every time with just a gentle nudge. If that's not enough, explore the same Avanity Modero collection for an espresso-finished linen tower and/or mirror to complement this bathroom vanity. Modero 30-Inch Vanity Cabinet in Espresso The Modero 30 in. vanity has a simple clean design with a rich espresso finish and brushed nickel hardware. It is constructed of solid poplar wood and veneer with soft-close doors and drawers that showcase its quality. Match it with the natural beauty and durability of a stone top and you create the perfect vanity ensemble. 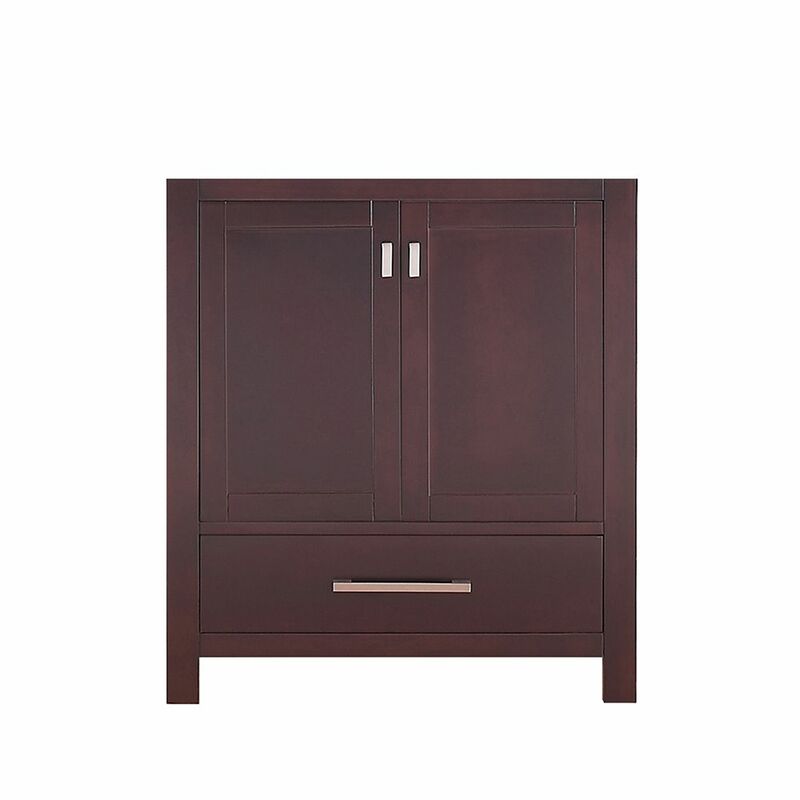 Modero 30-Inch Vanity Cabinet in Espresso is rated 4.8 out of 5 by 9. Rated 3 out of 5 by ZB from I kept the vanity because I didn't have time to... I kept the vanity because I didn't have time to replace but I'm not happy with it. It's sturdy and the drawer works well but it looks cheap to me. There is a gloss to the finish that just doesn't look right. It makes the vanity look plastic-y and ... like I said, cheap. Rated 5 out of 5 by Ranj from Great cabinet with soft close doors and drawer. Had to cut out more of the backing based on wher... Great cabinet with soft close doors and drawer. Had to cut out more of the backing based on where one of my water inlet lines were. Looks great in our newly remodeled half bath. Rated 5 out of 5 by Marilyn from I love it. It looks so nice in my half bath. I love it. It looks so nice in my half bath. Rated 5 out of 5 by Satisfied from It is very pretty and I love the soft close doors and drawer. The extra height is nice too. It is very pretty and I love the soft close doors and drawer. The extra height is nice too.